It will soon be possible to send the aroma of freshly-ground Brazilian coffee through the post and for it to be appreciated by people on the other side of the world. 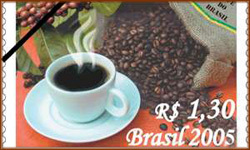 The Brazilian Post Office is going to launch a stamp for international mail that comes with a coffee smell. The idea is to publicise Brazilian coffee, currently losing sales to Colombia which invests a lot of money in promoting its produce. The Brazilian stamp is being printed at the country's mint but a private sector company is producing the coffee essence using special technology to ensure that the fragrance lasts. "The mature coffee bean is roasted, ground and filtered under pressure," said Alvaro de Oliveira Soares, Production Director at the Brazilian Mint. "The filters that the coffee goes through become saturated with the aroma and undergo a centrifugal type process. It's similar to a gigantic liquidiser, at a very high speed". The process creates microcapsules, full of liquid saturated with coffee aroma. These are mixed with a clear varnish, and the result is transferred to the printing machine. "After the stamp is printed, it is given a coating of this clear varnish, containing the microcapsules that are invisible to the naked eye," said the production director. "When the stamp leaves here, it already has the coffee fragrance." The specialists involved in the process of creating the stamp believe that its aroma should last between three and five years. Whenever someone wants to feel as if he is sitting in a coffee bar in Brazil, all he needs to do is to rub the picture of the coffee cup with his finger, disintegrating the microcapsules to release the aroma. This technology was used two years ago when the Brazilian Post Office launched a stamp with the smell of burning wood - a form of protest against deforestation in the country's Amazon region. "The stamp of the Brazilian rainforests was a success and even won international prizes," said Maria de Lourdes Fonseca, sub-chief of the Brazilian Post Office's philately department. "We are hoping for the same result with this new launch, which publicises the Brazilian habit of having a cup of coffee."